Economics > Transportation and communications > Water transportation > Shipping > Merchant marine. Ocean shipping. 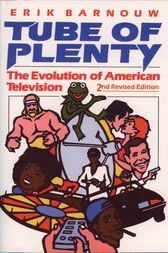 Based on the classic History of Broadcasting in the United States, Tube of Plenty represents the fruit of several decades' labor. When Erik Barnouw--premier chronicler of American broadcasting and a participant in the industry for fifty years--first undertook the project of recording its history, many viewed it as a light-weight literary task concerned mainly with "entertainment" trivia. Indeed, trivia such as that found in quiz programs do appear in the book, but Barnouw views them as part of a complex social tapestry that increasingly defines our era.To understand our century, we must fully comprehend the evolution of television and its newest extraordinary offshoots. With this fact in mind, Barnouw's new edition of Tube of Plenty explores the development and impact of the latest dramatic phases of the communications revolution.Since the first publication of this invaluable history of television and how it has shaped, and been shaped by, American culture and society, many significant changes have occurred. Assessing the importance of these developments in a new chapter, Barnouw specifically covers the decline of the three major networks, the expansion of cable and satellite television and film channels such as HBO (Home Box Office), the success of channels catering to special audiences such as ESPN (Entertainment and Sports Programming Network) and MTV (Music Television), and the arrival of VCRs in America's living rooms. He also includes an appendix entitled "questions for a new millennium," which will challenge readers not only to examine the shape of television today, but also to envision its future. Erik Barnouw, Professor Emeritus of Dramatic Arts at Columbia University, co-founded and chaired Columbia's Film Division for many years. He also helped to organize, and headed, the Writers Guild of America. He is Editor in Chief of the International Encyclopedia of Communications and the author of several books, including Indian Film (with S. Krishnaswamy) and The Magician and the Cinema.